Mom's biliary stent was part of the picture before we had even heard the word cancer. It was our first foray into the complicated, frustrating, scary world of cancer medicine. And even though we didn't have a clue what a stent was, we knew that it had given mom much needed relief of her jaundice and pain. So, believe me when I saw that pancreatic and biliary stents can be your friend. So here's the straight scoop from our basically non-medical background. A stent is simply a small tube inserted into a duct to keep it open. And you may ask, as we did, what do ducts and stents have to do with pancreatic cancer? I think pictures will do a better job of explaining then I ever could! So, let me share a few diagrams to get us started. First is an overall diagram of the abdomen or stomach area. It shows all the organs and how they connect to one another. 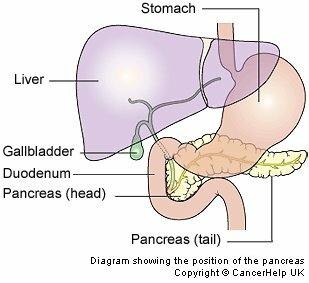 In this diagram you can see how the pancreas lays behind the stomach and close to both the liver/gallbladder and duodenum (small intestine). The next diagram is a close-up of the pancreas and the ducts or tubes that connect the pancreas with the gall bladder and duodenum (small intestine). The pancreas is responsible for secreting digestive enzymes and insulin into the small intestine. It does this through the pancreatic duct. The gall bladder is responsible for releasing the bile (that it stores from the liver) into the small intestine. It does this through the common bile duct. 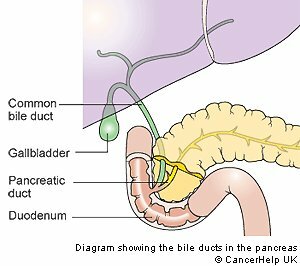 If you will notice in the above diagram, both the common bile duct and the pancreatic duct join together just before they dump into the duodenum or small intestine. Now, if you will, imagine a tumor growing in the head of the pancreas. As it grows it begins to press on the two ducts. With the increasing pressure, the ducts eventually get pinched off. Once that happens the digestive enzymes and bile can't get through and begin to back up. This starts a chain of events that we now realize as the start of mom's pancreatic cancer journey. Symptoms become obvious quickly once the ducts are squished shut. A backup of bile into the gall bladder causes rather severe physical effects, including nausea, dizziness, constipation, confusion, disorientation, and even in extreme cases, death. A person experiencing a build-up of bile will have a rise in their bilirubin levels and will become jaundiced. This is where the skin and the whites of the eyes become yellowed. A backup of the pancreatic enzymes results in extreme levels of irritation and pain in the pancreas as well. Enter the Pancreatic and Biliary Stent. Your knight on a white horse! Heroes to the rescue! And indeed they are life-savers. When mom went in for her first ERCP the gastroenterologist was basically doing an exploratory scope. We all thought she was having trouble with her gall bladder, which can often explain the pain and jaundice. When he got into her small intestine or duodenum with the scope, he immediately saw that the ducts had been closed off due to a mass. He inserted two plastic stents. One in the common bile duct and one in the pancreatic duct. The stent in the common bile duct is called a biliary stent. And the stent in the pancreatic duct is called a pancreatic stent. Easy enough. Back to the stents. As I said, the doctor inserted plastic stents in mom's ducts that first time. There are actually two kinds of biliary/pancreatic stents. Plastic and Metal. The plastic stents are considered temporary, as they tend to clog up with the bile over time. Their general lifespan is only 3 months. For mom, that lifespan was only about 6 weeks! I guess her bile is thicker than the average persons. Anyway, 6 weeks into the cancer journey, she again began experiencing pain, jaundice, fever (high, as in 104), chills, etc. The doctor went back in with an ERCP and replaced the clogged plastic stent with another plastic stent. When he came out of surgery this time, he mentioned that they do make a metal stent that lasts much longer, but he doesn't keep them on hand. We suggested, that perhaps he should order one for mom! We expect her to live longer than 3 months! thankfully he did and her biliary stent was replaced a month later with a metal one. 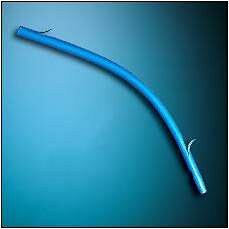 The pancreatic stent is still plastic. I understand that they seldom clog up, mainly because the digestive enzymes are thinner. Now, a word of caution about the metal stent. While it is a wonderful upgrade from the plastic stent, it is not for everyone. 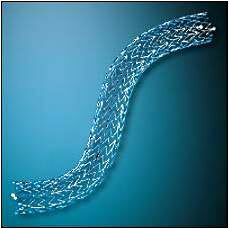 It seems that metal stents should not placed in patients with pancreatic cancers that might be surgically removed. The metal stents do damage the bile duct and make any subsequent surgery very difficult. It is very important to talk this over with your cancer healthcare team. If there is any possibility that you are a candidate for surgical removal, then avoid the metal stents. We knew from the beginning that mom's cancer was not resectable or removable. It was wrapped around the portal vein and made surgery impossible. So for her, the metal stent made perfect sense. It kept the bile flowing and gave her added months of comfort. Another word of caution: Insertion of the biliary stent and/or pancreatic stent is uncomfortable to say the least. While the procedure is done under anesthesia, the recovery is done while very much awake and is painful. Mom had increased pain for 3-4 days following the plastic stents. And when they replaced the plastic with the metal biliary stent, the pain increased monumentally for over a week. We became very concerned that the stent had somehow perforated her bowel, or gall bladder... We didn't have a clue, we only knew the pain was bad! After repeated calls to the surgeon, we finally got word that the pain was to be expected as the metal stents were larger diameter than the plastic and the duct was spasming around them as they adjusted. Great! Would have been helpful having that information from the beginning! Doctors!! Anyway, once the initial pain disappeared the stents did their job like true heroes! Relief of the jaundice and pain was paramount in keeping mom comfortable as she went through her cancer treatments. And just one other word of caution: I know, you're thinking, what's up with these stents?! But, this cautionary tale comes from our own experience and may help you avoid a similar nightmare. If you get a biliary stent, take inventory of your gall bladder. Do you still have one? Many people have theirs removed for all kinds of reasons: gallstones, gallbladder disease, etc. But if you do have a gall bladder, then listen up. About 6 months into mom's cancer treatment, she began to experience classic gall bladder attack symptoms, intense upper rib cage pain, fevers, chills and nausea. But her doctor team was so focused on the cancer that they never checked her gall bladder. First they ordered another ERCP to check the stents for clogging. They were fine, but the doctor saw something pressing on the colon. They immediately jumped to the conclusion that the cancer had metastised (you don't even want to know the despair mom felt). They increased her pain medication and sent her home. One doctor even tried to console us by saying that you know this could just be the natural progression of the disease. Hello?!! Not comforting! After a week and a half of nightmare quality pain and illness, we took mom to the ER and an emergency room doctor diagnosed a rotten gallbladder within 30 minutes! The gallbladder was so infected and swollen that it had adhered to the intestine and was most likely what the oncology doctor saw pressing on her colon. Once the rotten gall bladder was removed, the oncologist team was downright sheepish. They did explain, however, that the metal biliary stent leaves the valve open in the duct between the small intestine and the gall bladder. It normally closes until the gall bladder is ready to dump the bile. With the valve open continuously, it is much easier for bacteria to travel from the intestine up to the gall bladder, hence serious infection. Take a page from mom's pancreatic cancer journey, if you have biliary stents and your gall bladder, be forewarned! Even with all these cautions, the biliary stent and the pancreatic stent have been life-savers for mom. In this battle we need all the help we can get. Two little tubes have kept things flowing in the right direction. Can't be thankful enough!